Health is the largest gathering of healthcare and trade professionals with participation from over 20 countries. 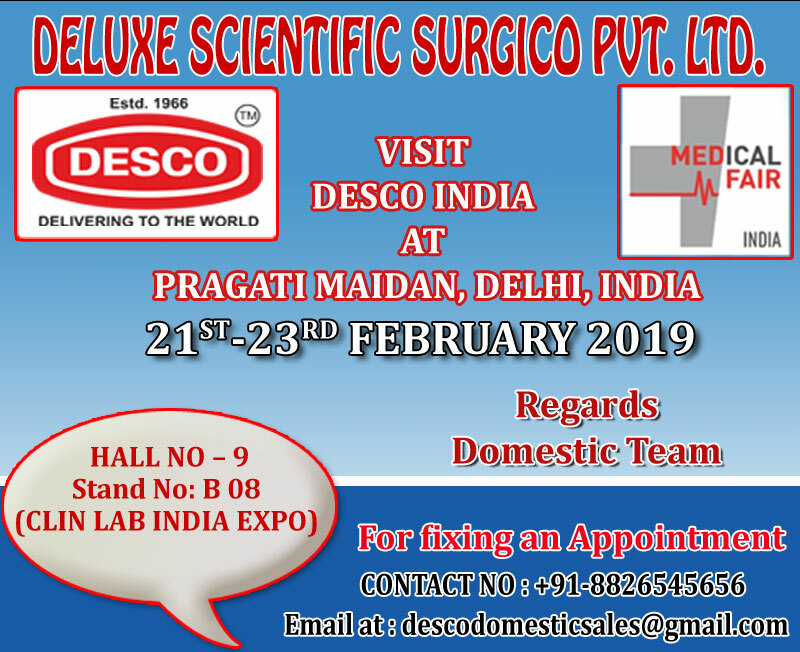 Desco India is actively participating in Medical Fair India 2019 to showcase their products. Deluxe Scientific Surgico Pvt. Ltd. AKA Desco India, has become a renowned manufacturer, supplier of all type of Medical Equipment’s, instruments & Hospital Furniture in over 92 countries in across the world. Desco Medical India is a pioneer in the field of manufacturing, supplying, and also in exporting the their latest medical and hospital equipment and product such as anesthesia products, autoclave equipment, cold chain equipment etc. Medical Hospital Furniture is itself a brand that manufacturing and exporting the medical and Hospital furniture such as Hospital beds, Examination Table, Mayo trolleys etc. Plastic Labware India is also performing to supplying and manufactures the outstanding products range for laboratory use such as plastic bottles, tubes, micropipettes, Flask etc. Desco India vision is to convey quality Medical Hospital equipment, Lab Instruments & Furniture to the end user at market comparable price. Our motto is to keep up long term straightforward relations and trust with the customers. DESCO always wants to come up with new models in medical equipment, hospital furniture and Laboratory use equipment & products.